One of the last American tourists to visit North Korea hopes to showcase the country’s complex nature. Jay would return in 2010, 2014, and 2017 — one of the last groups of Americans permitted to visit the country. On this last and perhaps final visit to the country, Jay used his camera to capture the Hermit Kingdom in a new light, shifting perceptions from a stolid dictatorship of the 1950s to something a bit more dynamic. In “Inside the North Korean Cocoon” Jay Tindall presents an North Korea stuck in time, certainly, but one that nonetheless struggles forward. Jay noted the change in infrastructure since his first visit: shiny glass buildings, microbreweries, and he points out that some were playing Nintendo emulator games on their Chinese knock-off phones, identified by fellow traveler Brett Bachman as Mario 64, Monument Valley, and even Farmville. Jay, of course, is something of an exception; a repeat visitor in the travel industry – even with the same guide – is a position that perhaps garners certain allowances. There were, of course, still rules: no military, no construction sites, nothing that might conceivably jeopardize national security. On August 2, following steady nuclear developments and the brutal and highly-publicized death of American university student Otto Warmbier, Rex Tillerson’s State Department issued guidelines via the Federal Register that U.S. passports would be invalid for travel to the DPRK starting September 1. 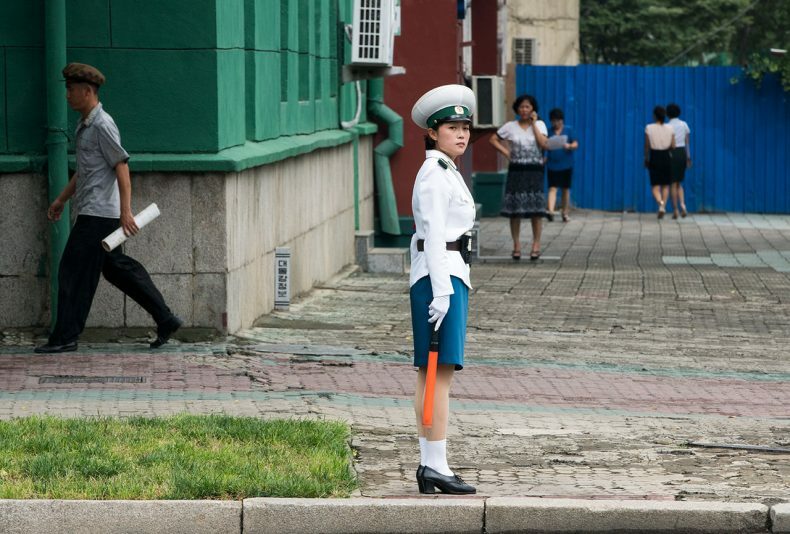 A crossingguard in North Korea. Photo by Jay Tindall. 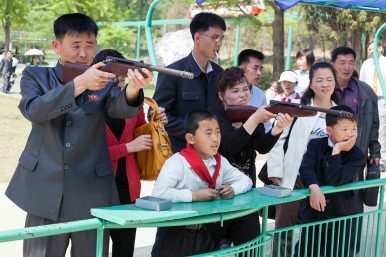 Journalists, tour operators, and activists have opposed the travel ban to North Korea – as did the North Korean authorities who were cited by KCNA as saying that the ban was “childish” and that visits from the U.S. citizens allow them to see “the true picture of the DPRK that achieves victory after victory under the banner of simultaneously building up the economy and defense and the failure of the U.S. hostile policy towards the DPRK.” Those supporting the ban cite North Korea’s consistent status as the world’s worst human rights abuser, the country’s persistent nuclear tests, and safety concerns. “Inside the North Korean Cocoon” emphasizes that North Korea is more than just one color: jumping dolphins, blithe commuters, realist propaganda, water parks. There is a perpetual war on the mind, but also dancing. Cairo remains one of Pyongyang’s leading trade partners in the Arab world.